Ship Weight : 27 lbs. Dr. Smoothie 100% Crushed Fruit Smoothie Concentrate contains no artificial flavors, colors, sweeteners, or preservatives. Get your burst of vitamins with an awesome Berry Blast taste! Available flavors include Forbidden Fruit, Orange Tangerine, Smooth Lime, Pineapple Paradise, and more in 1 quart bottles. Comes as a case of six 1-quart bottles, flavors of which can be chosen below. 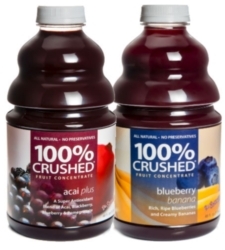 INGREDIENTS: Fruit (Blueberry Puree, Banana Puree), White Grape Juice Concentrate, Apple Juice Concentrate, Natural Flavors, Pear Juice Concentrate, Vitamins and Minerals, Guar and Locust Bean Gum, Malic and Citric Acid.